Last year I had a look at how much wickets cost in the IPL, and devised a formula to calculate the value of a bowler in a team. I used that formula in a number of other cases throughout last year, and it seemed to bring some fairly sensible results each time, so I've decided to try it again with this years IPL as the first stage draws to a close. Here is the top 15 bowlers, with their modified run rates. This takes into account the benefit that they have provided to the other bowlers in the team through the wickets that they have taken. I limited it to who had bowled at least 10 overs. Somewhat unsurprisingly the top name in the list is the current rising star of the IPL - Sandeep Sharma. 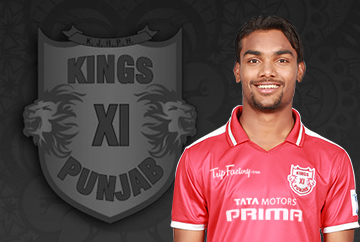 His heady medium pace bowling has been a big part of the success that Kings XI have enjoyed. Often medium pacers can enjoy good results in limited overs cricket through consistency, But Sharma offers something more than that. Right arm inswinger is a style of bowling that is normally only seen at the junior grades. Top senior batsmen normally develop a technique that allows them to avoid being dismissed by it, and then they can just wait for the inevitable bad delivery that slips into the pads and can be dispatched. Sharma has managed to bowl consistently enough that he has only been hit for one leg-side boundary in 11 overs. If players are having to look on the off side for their runs from an inswing bowler then they are at risk of leaving the gate open. If Sharma manages to continue to bowl as consistently, he could be potentially be a real force, not just for Kings XI, but also for India. He could be particularly useful in the World Cup in Australia/New Zealand where the ability to move the ball in the air is a real asset.